Make your every look an organized one with the b.ø.c.® Fairview Solid & PB Crossbody. Faux-leather material. Top-zip closure. 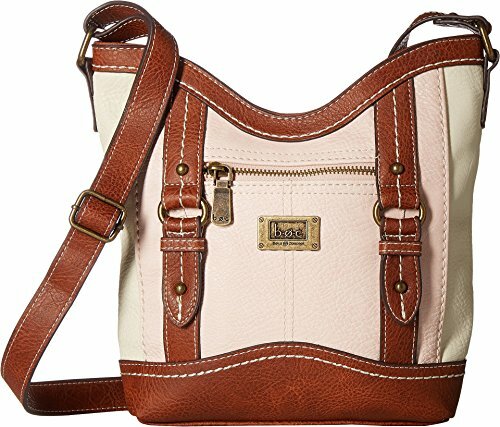 Adjustable cross-body strap. Exterior flaunts brand logo hardware and front zip-pocket. Lined interior features zip-pocket and slip-pocket. Flat-bottom. Imported. Measurements: Bottom Width: 8 in Depth: 2 1⁄2 in Height: 10 in Strap Length: 54 in Strap Drop: 25 in Weight: 15.4 oz This product may have a manufacturer's warranty. Please visit the manufacturer's website or contact us at warranty@support.zappos.com for full manufacturer warranty details. Make your every look an organized one with the b.ø.c.® Fairview Solid & PB Crossbody. Exterior flaunts brand logo hardware and front zip-pocket. Lined interior features zip-pocket and slip-pocket. Flat-bottom. Imported. Measurements: Bottom Width: 8 in Depth: 2 1⁄2 in Height: 10 in Strap Length: 54 in Strap Drop: 25 in Weight: 15.4 oz This product may have a manufacturer's warranty. Please visit the manufacturer's website or contact us at warranty@support.zappos.com for full manufacturer warranty details. If you have any questions about this product by B.O.C., contact us by completing and submitting the form below. If you are looking for a specif part number, please include it with your message.